Our IR Roof Technicians will determine your problem areas and only repair where needed. When moisture penetrates the surface of a roof it seeps in between the layers of roofing membrane and into the insulation. This renders the insulation useless (diminishing its R-Value); potentially leading to mold and mildew problems; rotting beams and supports and compromising the integrity of the remainder of material furthering the damage. Visible light is only a small sliver of the electromagnetic spectrum. Our cameras work with the infrared spectrum given off as thermal heat. Therefore the cameras image heat given off by different materials. 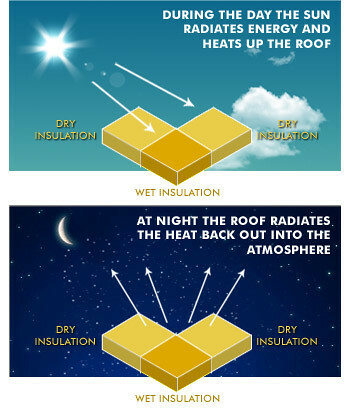 During the day the roof absorbs heat, which is then re-radiated out into the night. Now because the Heat Capacity of Water is higher than most commonly found roofing materials; water-damaged segments of the roof (water-damaged insulation) retains heat longer than areas unaffected by leakage. Therefore, these areas leave behind a noticeable heat signature which can be picked up by trained thermographic technicians who then mark the area and a team of experienced roofers can come in and fix all the sections deemed problematic – no guesswork involved. Infrared Imaging Technology not only afford us surgical precision in repairing damage already done, but allows for imaging of areas that may be damaged yet still appear visually sound – allowing for preventive maintenance. This can save you thousands of dollars on repairs, extend the life of your roof, and diverts millions of tonnes of garbage from landfills annually.